Dr. Findeis-Hosey is an academic pathologist who oversees the busy GI/Hepatobiliary Pathology service at the University of Rochester Medical Center. Along with her clinical practice, she devotes time to research and education efforts. Her research focuses on Lynch Syndrome and the development of care models for the increased identification of patients and families with this disease. She is active within the education community at the University, serving as Director of Undergraduate Pathology Education for the University of Rochester School of Medicine, where she teaches medical students across all four years and crafts curricular improvements. Additionally, she oversees the Explorations in Pathology intensive pre-college program offered by the University of Rochester (previously the Pathology Information Technology Program) where she works closely with select groups of high school students to impart her passion for pathology. 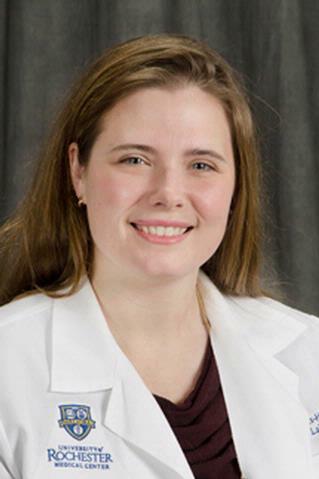 Dr. Jennifer Findeis-Hosey received her BS in Cellular and Molecular Biology with Honors in Biology from Bucknell University in 2002 and her M.D. degree from The Pennsylvania State University College of Medicine in 2006. She completed her residency in Anatomic and Clinical Pathology at the University of Rochester Medical Center, during which time she spent an additional year of training performing research in the area of Thoracic Pathology. She subsequently completed a fellowship in Surgical Pathology at the University of Michigan, Ann Arbor, MI, where she spent focused time in the area of Gastrointestinal Pathology. She is presently an Associate Professor in the Department of Pathology and Laboratory Medicine where she serves as Director of the GI/Hepatobiliary Pathology section. Within the School of Medicine she serves as Director of Undergraduate Pathology Curriculum. Additionally, she serves as Director of Explorations in Pathology, a summer enrichment program for high-school students interested in learning about pathology. Her interest in on-line education has lead to the development of the PathologyNOW series of videos. As a surgical pathologist, Dr. Findeis-Hosey specializes in Gastrointestinal and Hepatobiliary Pathology. Her research interests include clinical and translational efforts in the field of gastrointestinal pathology. She is interested in Lynch Syndrome and the development of streamlined care models for patients with hereditary colorectal carcinoma syndromes. Other academic interests include medical education and the development of novel tools for the teaching of pathology. Noor M, Katzman PJ, Huber AR, Findeis-Hosey JJ, Whitney-Miller C, Gonzalez RS, Zhou Z, N'kodia HD, Skonick K, Abell RL, Saubermann LJ, Lamps LW, Drage MG. "Unexpectedly High Prevalence of Cystoisospora belli Infection in Acalculous Gallbladders of Immunocompetent Patients." American journal of clinical pathology.. 2019 Jan 1; 151(1):100-107. Yurgelun MB, Chittenden AB, Morales-Oyarvide V, Rubinson DA, Dunne RF, Kozak MM, Qian ZR, Welch MW, Brais LK, Da Silva A, Bui JL, Yuan C, Li T, Li W, Masuda A, Gu M, Bullock AJ, Chang DT, Clancy TE, Linehan DC, Findeis-Hosey JJ, Doyle LA, Thorner AR, Ducar MD, Wollison BM, Khalaf N, Perez K, Syngal S, Aguirre AJ, Hahn WC, Meyerson ML, Fuchs CS, Ogino S, Hornick JL, Hezel AF, Koong AC, Nowak JA, Wolpin BM. "Germline cancer susceptibility gene variants, somatic second hits, and survival outcomes in patients with resected pancreatic cancer." Genetics in medicine : official journal of the American College of Medical Genetics.. 2019 Jan 0; 21(1):213-223. Epub 2018 Jul 02. Huber AR, Sprung BS, Miller J, Findeis-Hosey JJ. "Esophageal Mucosal Calcinosis: A Rare Site of Gastrointestinal Mucosal Calcinosis." The American journal of case reports.. 2018 Apr 6; 19:406-409. Epub 2018 Apr 06.